If you like high-arc gooseneck designs and the traditional style, the Kohler K-780-VS Cruette might be exactly what you’re looking for. It’s elegant, durable and functional, and it comes from one of the most reliable brands in the industry. This kitchen faucet also offers the pull-down functionality to make your cleaning effortless and quick. To learn more about the features and understand if it’s really worth the investment, continue reading our Kohler K-780-VS Cruette review. 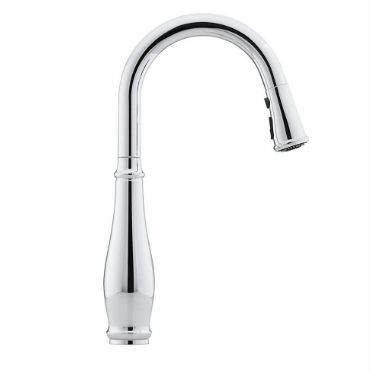 The sleek high arc spout elegantly rises over the sink with the height measuring 16-3/4 inches. This gives plenty of room under the faucet for clearing there big pots and other cookware. If you need even more space in the sink, you can get the spout out of the way by rotating it to the left or right. It rotates the full 360-degree circle. This feature is especially useful for double basin sinks as you can direct the water flow in whichever sink you’re working from. Other elements of design include the single-lever control of both the water temperature and water volume. This allows single-handle faucet operation, which is extra handy when you’ve got one of your hands full. The construction is made using solid metal, which ensures a long break-free life of the faucet. The durability of the faucet is also enhanced using Kohler durable finishes. The available options include vibrant stainless, polished chrome and oil-rubbed bronze. All these colors are premium quality finishes that provide resistance to corrosion and tarnishing. Vibrant stainless and polished chrome are more universal colors that can easily be matched to other elements of decor in your kitchen. The oil-rubbed bronze, on the other hand, offers a more rustic feel and is a perfect option for those that want their kitchen faucet to really stand out. Another feature of this Kohler Cruette faucet’s durable design is the ceramic disc valves. This type of valves is the industry standard of longevity. They provide durable performance for many years of operation. With the Kohler K-780-VS Cruette, you’ll be able to enjoy pull-down kitchen faucet functionality. It means that it comes with a detachable spray head that can be extended down into the sink for more effortless cleaning. It’s connected to the faucet using a retractable flexible hose and a magnetic docking system called DockNetik. The pull-down design uses Kohler’s ProMotion technology. It’s the combination of a flexible nylon hose and the ball joint element, providing more comfortable and more maneuverable use of the spray head. The spray head features a button for switching between its three functions. There’s the regular stream mode for those everyday kitchen sink tasks. There’s also the Sweep Spray mode that’s perfect for rinsing dishes or other tasks that need a more powerful water force. Lastly, there’s the Boost Technology mode that provides even more powerful spray power. It increases the water flow by as much as 30%. Moreover, you also get the pause function to make a quick stop of the water flow in between tasks. Kohler has designed this faucet to make the installation as easy as possible. They also provide the flexible supply lines, the installation ring and the optional escutcheon. If you have a bit of DIY experience, you’ll probably be able to complete the whole setup in under 30 minutes. In the installation manual, you’ll find clear instructions that are easy to understand and follow. You can also find easy to follow youtube instructions. Even homeowners without any plumbing experience should be able to install this faucet on their own. However, you can also skip the hassle and make sure that the faucet is properly installed by hiring a professional plumber. 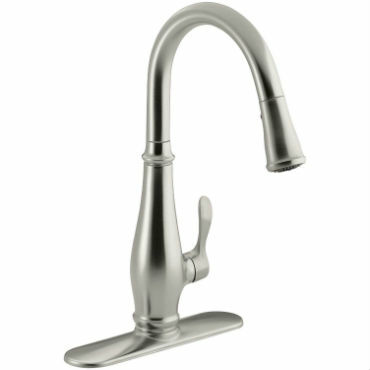 This Kohler K-780-VS Cruette kitchen faucet is suitable for both 1 and 3-hole mounting. For the 1-hole installation, you can mount this fixture straight on your sink or counter. For 3-hole installation, on the other hand, you’ll need to use the provided escutcheon. One of the advantages of buying a kitchen faucet from a well-known brand, such as Kohler, is the warranty and customer support they provide. The Kohler brand offers a limited lifetime warranty for this faucet. It covers any defects in material and workmanship under normal residential use. However, keep in mind that it covers only the original purchaser. Another thing to take into account is that if you plan to install this fixture for commercial use, the warranty period is limited to one year. Solid construction made of premium metal. Pull-down function that offers an easily maneuverable spray head with 3 different modes. Some users have commented that the spray mode creates a lot of splash. However, to avoid it going all over the place just make sure that you turn it on only after you pull down the spray head. In all, most of the buyers are very satisfied with their Kohler K-780-VS Cruette purchase. The faucet looks great, performs well and lasts a long time. It also offers great flexibility and functionality, simplifying for you carrying out all those kitchen sink tasks. Moreover, you get the limited lifetime warranty with the faucet and if anything goes wrong, you can always contact the helpful Kohler customer support. So it might not be the cheapest kitchen faucet on the market but it definitely offers great value for the money.